Alexandria, VA – Nothing says summer fun like family-friendly music and food festivals, movies under the stars and fireworks along the Potomac. Located just minutes from Washington, D.C. and with a nationally designated historic district, Alexandria, Virginia, is the ideal location for your summer vacation with more than 35 special events coming Memorial Day through Labor Day. Highlights include unique events at George Washington’s Mount Vernon and authentic American history experiences in George Washington’s hometown, from family tours led by junior docents at Gadsby’s Tavern Museum to a Civil War reenactment at Fort Ward Museum & Historic Site. 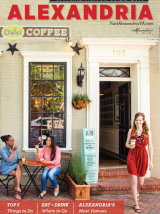 Foodies can enjoy the summer weather at more than 30 restaurants that offer al fresco dining along King Street and at numerous festivals like the Taste of Del Ray Food Festival and Vine on the Waterfront Food & Wine Festival. Waterfront activities abound and boat cruises cater to everyone from baseball fans to our four-legged friends to those wanting to visit the scenic National Mall. New this year is the 150th birthday celebration for world-renowned American architect Frank Lloyd Wright at the Pope-Leighey House, the only Frank Lloyd Wright house open to the public in the D.C. region. At Summer Escape at Mount Vernon, visitors will enjoy craft beer, historic culinary treats and live bluegrass music at sunset from the lantern-lit grounds of George Washington’s estate. Wrapping up the summer months is a special project by Swiss light artist Gerry Hofstetter who will wow visitors with breathtaking projections on the George Washington Masonic National Memorial. July 8, 2017 from 6-10 p.m. Visitors celebrate America’s 241st birthday and Alexandria’s 268th along the Potomac River waterfront at Oronoco Bay Park and enjoy live music by the Alexandria Symphony Orchestra, patriotic birthday cake, food vendors and a dazzling fireworks display. Celebrate Labor Day weekend and the end of summer taking in Swiss light artist Gerry Hofstetter’s breathtaking work as it illuminates the George Washington Masonic National Memorial after sunset on September 3, 2017. The George Washington Masonic National Memorial is one of the early stops on Hofstetter’s three-year Illumination Tour that kicks off in August and visits one monument in each of the 50 states. Alexandria is proud to have been selected as the location for Hofstetter’s art in Virginia. Hofstetter, one of the world’s best-known light artists, transforms buildings, monuments and natural beauty spots into contemporary works of art. He has created projections of the Titanic on icebergs in the arctic, hieroglyphics on the ancient pyramids of Egypt, and abstract colorful images on the Washington National Cathedral. Hoffstetter, along with his event planner partner Hayes Group, LLC of Vienna, Virginia, will be creating a memorable event that will showcase the best of Virginia. More information about related events will be announced in the coming months. May 29, 2017 from 1-6 p.m. The 40th Annual Memorial Day Jazz Festival will feature a variety of talented musicians and diverse styles of jazz throughout the day. Festival attendees are invited to bring lawn chairs and blankets. Food will be available for purchase or you can pack a picnic. June 4, 2017 from 1-3 p.m.
June 9 & 10, 2017 from 6-9 p.m.
Sip craft beer and taste local and historic culinary treats while watching the sun set at the first president’s home! Relax to live bluegrass music from Bud&apos;s Collective, play colonial games, and unwind against the backdrop of the Potomac River. Mount Vernon’s chocolatiers will demonstrate the process of making chocolate while serving up chocolate martini samples. The event also offers foodies a chance to talk with a 18th-century herbalist and sample flavorful herb-infused dips and teas. After sampling culinary treats and libations, stroll the lantern-lit grounds and immerse yourself in the 18th century as you mingle with costumed residents. Enjoy 18th-century music, dancing, ice cream making demonstrations, and more historic fun. June 10, 2017 from 10 a.m.-4 p.m.
June 10, 2017 from 10 a.m.-6 p.m.
June 17 & 18, 2017 from 9 a.m.-5 p.m.
June 18, 2017 from 1-5 p.m.
June 18, 2017 at 2 p.m.
Join Alexandria&apos;s Historic Breweries author, Garrett Peck, and Portner Brewhouse co-founder, Catherine Portner, on a guided walking tour around Old Town Alexandria exploring the foundations of local brewing. The tour includes highlights from the print brochure, a Portner Brewhouse sponsored beer sampling, and culminates at one of Alexandria&apos;s current Hop Stops. Each tour will feature local homebrewers that are interested in your feedback as part of Portner Brewhouse&apos;s Craft Beer Test Kitchen™. June 24, 2017 from 10 a.m.-2 p.m.
June 30 & July 1, 2017 from 6-9:45 p.m.
July 4, 2017 from 9 a.m.-5 p.m.
An American Celebration includes an inspirational naturalization ceremony for new citizens with a special keynote address, daytime fireworks, military re-enactments, a special wreathlaying ceremony, free birthday cake for all (while supplies last), and a visit from General and Mrs. Washington. Enjoy a performance by the National Concert Band during its "Red, White and Blue" concert. Spend a truly inspiring day at a truly inspiring place. July 22, 2017 from 3-8 p.m. The 10th Annual Del Ray Music Festival is a celebration of local talent, demonstrating what an exciting music community we have right here in the D.C. area. Local musicians will perform on two stages in the heart of Del Ray. Mount Vernon Avenue will be closed to traffic between E. Uhler and E. Custis Avenues. Del Ray&apos;s independently owned restaurants will host beer gardens offering great food and brews all day. Del Ray Music Festival is proud to highlight local music and a chance to celebrate summer with your friends and neighbors. As always, the Del Ray Music Festival is a free event. July 30, 2017 from 1-4 p.m. In honor of Harry Potter’s birthday, the Stabler-Leadbeater Apothecary Museum is offering family-friendly tours that explore the real world of science and medicine behind J.K. Rowling’s Harry Potter series. Cost is $6 per person; children must be accompanied by a ticketed adult. Tickets go on sale July 1 for timed entry at shop.AlexandriaVA.gov. This event sells out, so purchase in advance! July 30, 2017 from 6-9 p.m.
It’s the 20th anniversary of the world meeting Harry Potter! Relive the magic of the books and explore the real world of Harry Potter while enjoying an inspired cocktail crafted by Old Town Dolci Gelati Cafe. Hour-long tours with timed entry between 6 and 9 p.m. include time for pictures in the photo booth (bring your own camera) and a make-and-take inspired by the series. Cost is $20 and tickets go on sale July 1 at shop.AlexandriaVA.gov. This event sells out, so purchase in advance. August 5, 2017 from 9 a.m.-2 p.m.
June 11, July 9, and August 13, 2017 from noon-1 p.m.
June 30, July 28 and August 18, 2017 from 8:30-11 p.m. The City of Alexandria invites you to a screening of family-friendly movies on June 30 (Ben Brenman Park), July 28 (Waterfront Park) and August 18 (Market Square). Admission is free. Be sure to bring blankets or a beach chair and enjoy an outdoor movie. Arrive early to choose your seating and feel free to bring a picnic supper. Some light concession sales. July 8 and August 5, 2017 from 1:30-3 p.m.
Fridays throughout the summer at 7:30 p.m.
Saturdays June 10 & 24, July 15 & 29, August 12 & 26, 2017 departing at 11 a.m. Enjoy this 50-minute narrated tour of the colonial Alexandria Seaport of Old Town. Cruise highlights include Founders Park, Old Town Yacht Basin, Captain’s Row, Jones Point Lighthouse and so much more! Pedal along the Potomac from Old Town Alexandria to George Washington’s estate via the Mount Vernon Trail. Spend the day at the first president’s humble abode then board the Miss Christin for a narrated boat cruise back to Old Town on Potomac Riverboat Company’s Mount Vernon by Bike and Boat tour. The Potomac Riverboat Co. offers water taxi services directly from Old Town Alexandria to the National Mall in Washington, D.C. This 30-minute cruise aboard the Miss Sophie connects D.C. with its oldest neighborhood, docking just steps from the Martin Luther King, Jr. Memorial, popular Smithsonian museums and a Capital Bikeshare station. First Sunday of every month starting at 9:30 a.m.; third Sunday of every month starting at 10:30 a.m.
Are you a bicyclist who loves beer and lives in the DMV? Be a part of Port City’s Pedals ‘N’ Pints! Course length and difficulty depend on the week, so be sure to check the website. All participants will need to sign a waiver beforehand. Helmet wearing is mandatory for riders of all ages. Port City bike jerseys and performance Pedals ‘N’ Pints shirts will be available for sale before and after the ride. Every Monday at 7 p.m.
Do you measure fun by the pint or by the mile? Try it both ways every Monday night at Joggers & Lagers with Pacers Running. Come out at 7 p.m. to take part in the 1, 3 or 5 mile fun run that takes off and returns to our Tasting Room, which opens at 4 p.m. Expect a fun crowd, support from Pacers Running staff, and periodic visits from their vendors to let you test out their latest offerings. Taking it at your own pace, you will enjoy running our pleasant route through a park and along a trail that follows the water of Holmes Run. Come stretch out with us at 7 p.m. for Beer Yoga. There is a $15 registration fee that covers the class and a post-yoga pint. (Make sure you get your pint ticket when you check in.) There are only 40 spots available for Beer Yoga, so sign up for the class online. (Registration will open up for this class the day of the prior class at 8 a.m.) What to bring and wear: Yoga mat, bottle of water and towel. Wear comfortable clothing you can easily move in, bend and stretch. We do yoga in the brewhouse and the temperature fluctuates depending on the weather, so make sure you wear layers. Every Sunday June 25-Labor Day from 2-5 p.m.
Special family tours led by junior docents grades 4-7 and ending with hands-on activities in the ballroom will be offered every Sunday from 2-5 p.m. at Gadsby’s Tavern Museum. Thanks to stationed guides, families will be able to start a tour as soon as they arrive and move through the museum at their own pace, and children will be able to connect with the museum through their peer tour guides.